Luis Ortiz, nicknamed after the famed cinematic monster, continued his run toward heavyweight prominence with a knockout of Tony Thompson, whose nickname recalls the decisively less intimidating cereal mascot. Ortiz had Thompson on the canvas in the first round, floored him again in the third round, and finished him in the sixth. The result wasn’t at all a surprise. 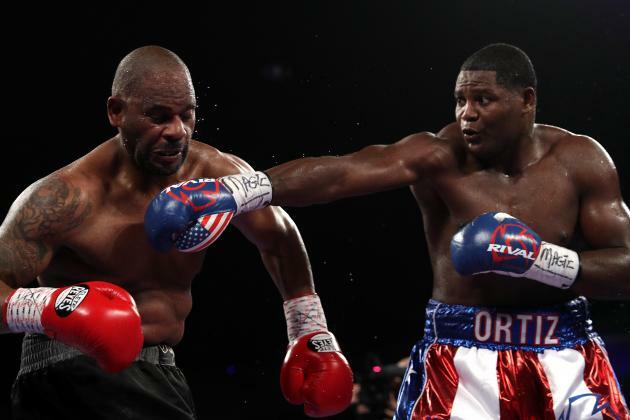 Ortiz is nearly 37 but is quickly earning consideration as a top contender. He is a product of the famed Cuban amateur system, and his hand-speed and power make him a threat against any of boxing’s big men. Ortiz blasted through Bryant Jennings late last year; that victory gave HBO good reason to bring him back and build him up for an eventual title shot. Ortiz was there because of his future. Thompson was there because of his past. He was a replacement opponent when another heavyweight decided he wasn’t getting enough money to face Ortiz. Thompson is a 44-year-old who is familiar to those who saw him lose twice to Wladimir Klitschko. He’d still been able to provide a stiff challenge in his advancing age, handing prospect David Price a pair of embarrassing technical knockout losses in 2013. There was a level he could no longer beat, though. Thompson dropped decisions to Kubrat Pulev in 2013, Carlos Takam in 2014 and Malik Scott in 2015. All three of those men had lost against the upper level of heavyweights. The loss to Scott seemed at the time as if it meant the end of Thompson’s career. And then the call came to face Ortiz. The difference between them quickly became clear. The first knockdown came when Thompson leaned away from a pair of southpaw jabs from Ortiz in the first round and brought his head back into an Ortiz left hand. Thompson survived and began to use movement and countering to give Ortiz some difficulty. Thompson was winning the third round until the final seconds, when Ortiz landed another left hand and scored another knockdown. The end was inevitable. It came in the sixth. Ortiz threw a left hand over Thompson’s right jab. Thompson dropped. Ortiz knew it was over, climbing the ropes to celebrate while the referee counted to 10. 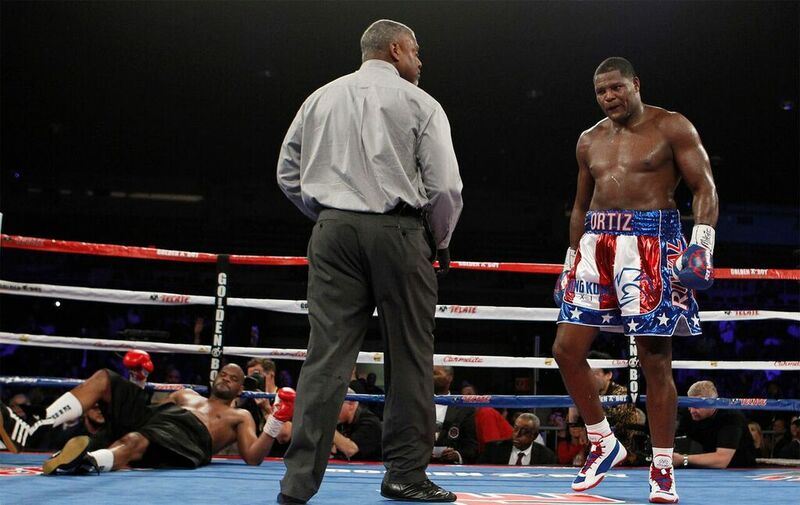 Ortiz, who is now 25-0 with 22 knockouts, may face Alexander Ustinov next. The winner of that fight could potentially challenge the winner of an upcoming rematch between Tyson Fury and Klitschko. Thompson is now 40-7 with 27 KOs. 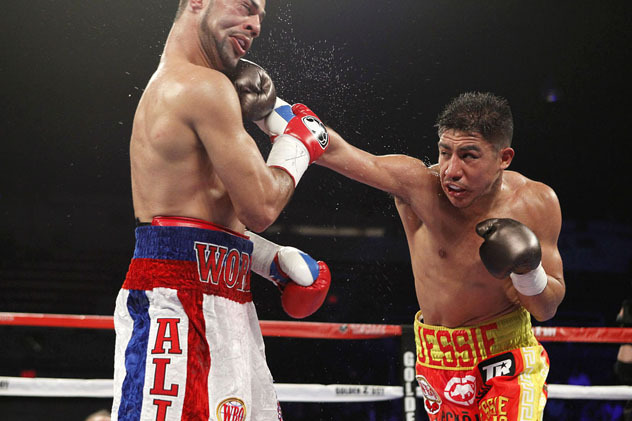 A quick look at Jessie Vargas’ record suggests that he doesn’t have much power. His past two fights indicate otherwise. Vargas rocked Timothy Bradley badly in the final round of their fight last June but had to leave with a unanimous decision loss. This time he finished what he started, knocking Ali down two times and winning a ninth-round technical knockout. The victory earned Vargas a vacant welterweight title that had previously belonged to Bradley. Ali was Bradley’s mandatory challenger; Bradley chose instead to give up the belt and take a third fight with Manny Pacquiao. Ali and Vargas each had their moments in the first part of the fight. The action between the two 147-pounders heated up in an exciting fourth round. Vargas then took the fifth and the sixth. By the seventh, Ali’s right eye was showing signs of swelling. Toward the end of the eighth, Vargas threw a jab, leaned his head forward and sent out an overhand right, a sequence similar to the one that had rocked Bradley. Ali dropped hard, beating the count but hurt enough that he walked back to the wrong corner. The minute between rounds wasn’t enough for Ali to recover. Vargas knocked him down again in the ninth. Ali got up and tried to survive. Vargas continued to land. The referee felt Ali had too little left to offer and stepped in to halt the fight. Vargas had gone four and a half years without a knockout, an 11-fight stretch in which he won 10 decisions (a couple of them controversially) before losing to Bradley, the sole defeat on a record that now reads 27-1 with 10 KOs. He still feels as if he was deprived of a chance to beat Bradley; the referee ended that bout early after mistakenly thinking the sound of the 10-second warning was actually the final bell. Ali now has the first blemish on his record. He is 22-1 with 13 KOs. 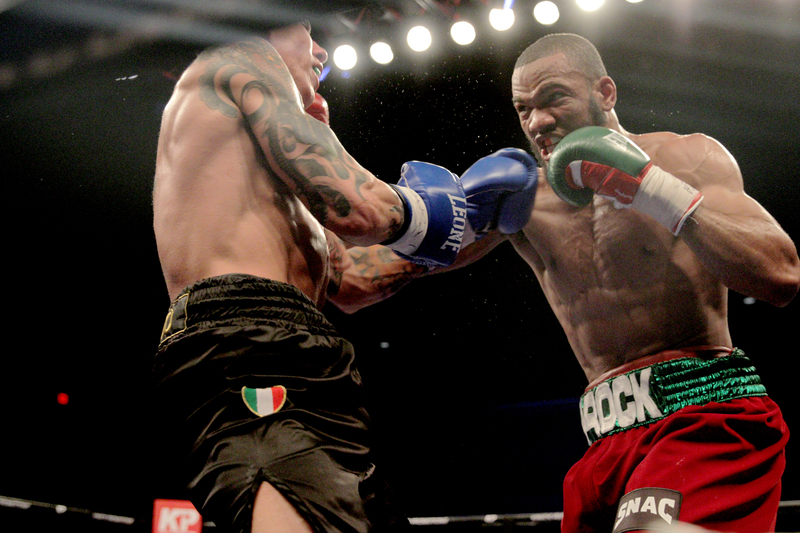 An easy win has put Julian Williams into position for a much more competitive challenge. The 154-pound contender took out the overmatched Marcello Matano, earning a fight with junior-middleweight titleholder Jermall Charlo. Williams was having little trouble hitting Matano well before rocking him badly in the seventh round. Matano staggered around the ring and wobbled even more whenever Williams landed. The referee properly saved Matano from further punishment. Matano, who is now 16-2 with 5 KOs, never belonged in the ring with someone on Williams’ level. Williams, meanwhile, belongs in the ring with Charlo. He is now 22-0-1 with 14 KOs and need not face any other lower-level opponents. Charlo is a month younger than Williams, is also undefeated at 23-0 with 18 KOs and is coming off a 2015 in which he won a world title from Cornelius Bundrage and then defended it by making quick work of Wilky Campfort. The fight would represent a step up in competition for both. That’s appropriate, because a victory would elevate the winner among his peers.